I hope you are all enjoying the beautiful sunny weather, I have! Burger and a Kopparberg in the sun made a perfect afternoon. 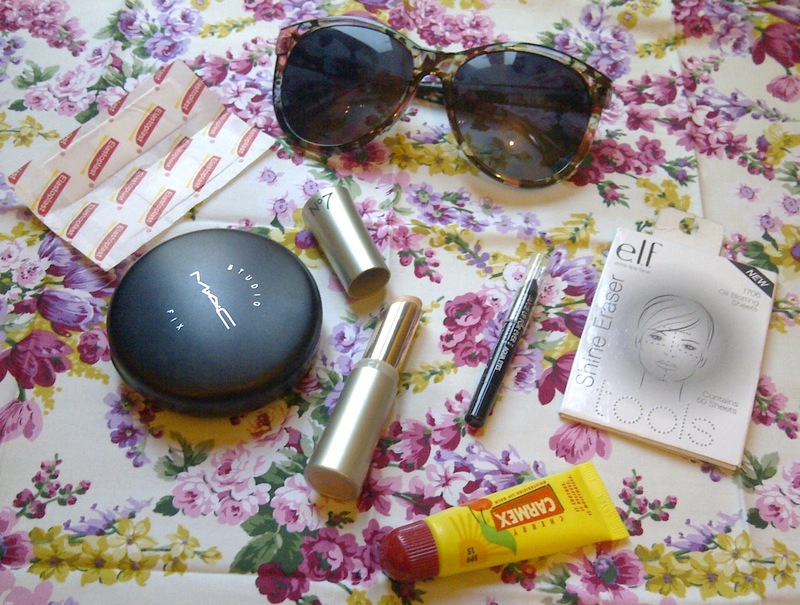 I thought I'd update you on a few things I like to carry when the sun shines. My summer must have is the ELF blotting sheets, these were so cheap and take away all the horrible shine from my oily skin. No foundation will ever stay matte on my skin, so blotting sheets are always carried. 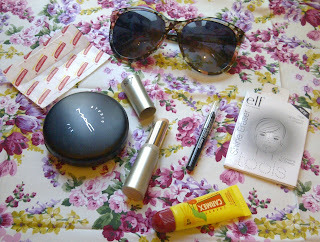 MAC Studio Fix Powder and No7 Quick Cover Blemish Stick are for when I need to re-apply through the day, sunglasses marks can easily be covered by these two products. Next in my emergency kit is MUFE Aqua Liner, often I find my usual eyeliner melts with the heat, this is waterproof so has perfect staying power! Then I always carry Carmex it's great for chapped lips but it also has an SPF of 15, lips need protecting too! Of course you need sunglasses and plasters in your bag, those nice new sandals always give you blisters! Do you have an summer emergency kit? My eyeliner always wears off throughout the day. I might try this one - Rimmel just isn't quite doing the job. Although its about to be Fall in Australia, it's still really warm.